The south of France is renowned for its beautiful beaches, Mediterranean climate and a clientele made up of the rich and famous. Whilst for some the summertime bustle is all part of the south’s charm, others may prefer to take a more laidback approach to France. The northern region, with its rolling countryside, historical sites and a more manageable climate, offers the perfect destination for a care-free, continental break. Get your holiday off to a great start by looking for great deals on ferries to France, and taking a look at our list of the best places to visit in the area. Renowned for its seaside cliffs, rolling hills, delicious cheeses and apple orchards, Normandy is a great place to visit all year round. 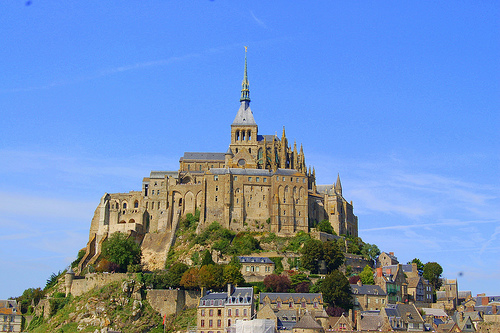 During your stay, take a trip to Mont Saint-Michel, to view one of the most iconic sights in France. The structure consists of a village and monastery built atop a rocky mound that lies in the middle of a tidal flat. Considered one of the wonders of the western world, this magnificent abbey is one not to be missed. Once a grimy, industrial hub, Lille is now known throughout the country as an attractive city with a vibrant cultural scene. Attractions include the renowned Fine Arts Museum, second in size only to the Louvre, and the quaint Old Town, which comes to life on Sundays and is made up of beautifully restored buildings and charming narrow streets. For some fun at nightfall, head to Rue Massena, where you’ll find an abundance of bars, clubs and restaurants. Taking the ferry, this charming port town will be your first stop in France. Instead of passing through en route to your next destination, why not stay and explore what Calais has to offer? One of the best things about Calais is the vast array of excellent restaurants found here and, if you’re a fan of seafood, you’re in for a real treat! Make your way over to La Sole Meuniere for a delicious seafood dinner, with views across the yacht basin. The former capital of Brittany, Nantes is brimming with history. This is none more present than in the city centre, where you’ll find the grandiose Castle of the Dukes of Brittany. The oldest parts of the castle date back as far as the 13th century, whilst other sections have been recently restored to great detail. After a day soaking in the history, Nantes offers a vast array of bars and restaurants serving up delicious food and drink, as well as a lively nightlife.